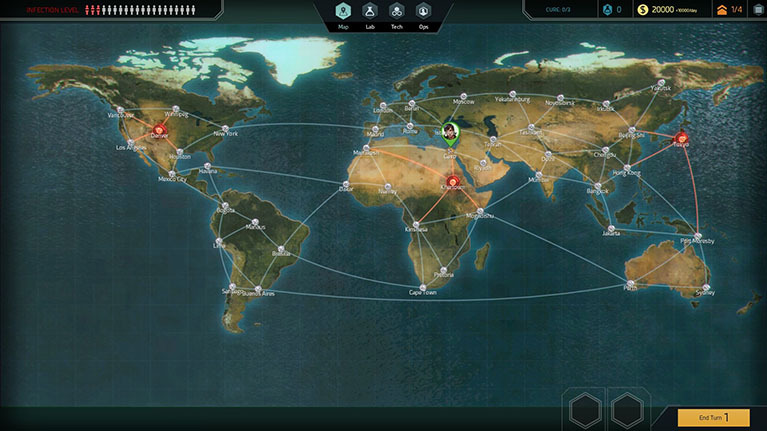 Quarantine is, in principle, the opposite of another game we here at DDNet really enjoyed; Plague Inc: Evolved. In that game you needed to help a virus spread and destroy the world. In this turn-based strategy game, you must try to prevent the disease from destroying the world. Related reading: Plague Inc. is the perfect casual strategy game. Matt's review of the game on PlayStation 4. To do this, you take on the role of the director of a team out to fight a new outbreak. At the start of a new game, you can pick what you want the disease to be; a bacteria, virus, or prion. Each one acts a little differently; where one might spread quickly to uninfected cities while spreading slower in cities that are already infected, the other might work the other way around. The disease can also mutate and depending on what one you pick, that can also happen at different rates. Anyone who understands diseases knows that mutations are something to be feared indeed. After selecting the type of disease and difficulty setting you will select your leader. There are four leaders to pick from each with their own perks. The security leader makes it so your operatives receive less damage. A medic who lets your operatives receive more XP for actions. The diplomat who lets you make one extra field office. Finally, the scientist who makes the disease need more mutation points before it can mutate. After selecting who to start with you will pick a city for your HQ, you can pick from Cairo, Tokyo, London, and Los Angeles. You are free to pick any one of those as it really doesn't seem to effect the game in any way. Don't worry if the particulars of the above aren't immediately evident; it doesn't take long to get a feel for the game's various systems. Once you are done the game starts and shows a world map which shows what cities are infected and what cities might become infected. From here your free to do what you want you can build more field offices to make more money, hire up more operatives to get on the field and help beat the disease, or help cities out by quarantining them or start a treatment operation. The last few things you can do is start a sampling operation to gather samples of the disease and heal an operative. You will also be able to select a tech to research. Everything takes both time and research, and as with all good strategy games, there will be more to do than resources to do them. Every type of operative excels at something. The scientist, for example, can gather one extra sample of the disease for each level he is. The medic, on the other hand, can use treatments better and reduces the infection by one extra per level. Hiring operatives also cost money so it's always a good idea to have a few extra field offices. 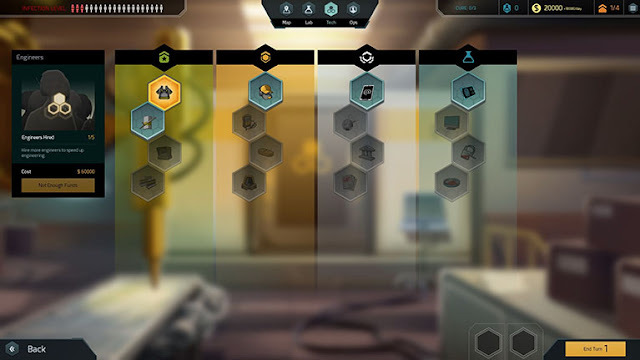 To cure a disease you will have to gather a certain number of samples and then use the lab to research a part of a cure most games there will be three parts to research before you find the cure. Researching the cure takes some time though at seven turns per segment of the disease. You can again hire more researchers to speed things up, but these are expensive. Once the cure is found you win the game. 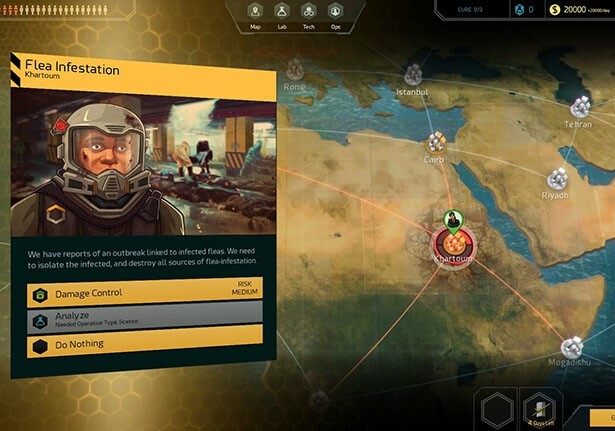 While battling the disease your operatives will carry out missions like quarantining a city which keeps the disease from spreading to other cities or keeping the disease out. You can also perform treatment operations that reduce the infection in a city. All the things you can do may harm your operatives and you can heal them by letting them rest a turn but if you decide not to and their HP runs out they will die and you will lose them for the rest of the game. Events happen randomly as turns go by and if you have the funds and the right operative you can try to resolve the issue. By successfully resolving the issue the disease will not spread and you sometimes will get funds as an award. If you don't resolve it the disease will get a big boost to the infection to the city it happened in and to surrounding areas. There isn't really a lot to Quarantine at the moment. It's an easy game to understand and after beating it a few times it doesn't really offer anything new. There is no story mode or campaign but it's one of the most asked for features and I'm sure the devs will be working on one. It's an Early Access game with plenty of time before its full release, and the devs are listening to all the feedback and are always improving the game, so even though it's not much more than a framework at the moment it is fun to play, which is, at this stage, what's important.